Part of the permanent collection of the City of Falmouth, Massachusetts. 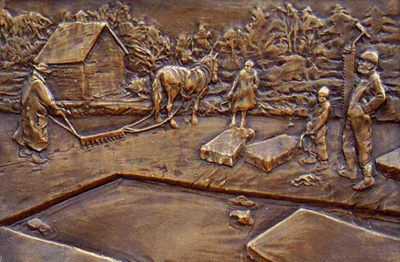 Sculptor Sarah Peters recently created a series of eleven bronze bas-relief plaques for the town of Falmouth, Massachusetts. 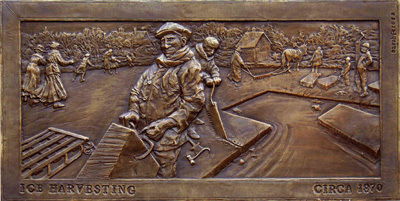 Commissioned by a group of public art enthusiasts known as "The Committee to Encourage Public Art", the plaques represent many of the historic industries that were significant to the town. 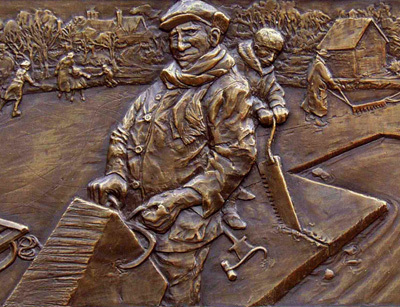 After each plaque was completed (a process which took ten months to complete and three weeks to cast), it was permanently installed along the sidewalk that abuts the library lawn on Main Street. Click here to return to Sarah Peters' main page.